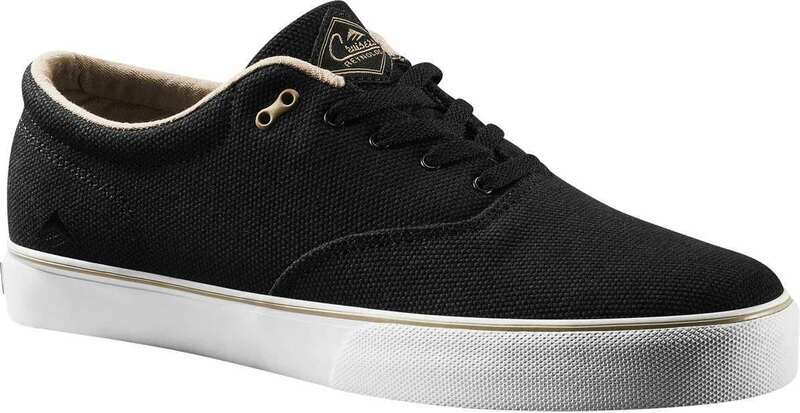 Emerica’s Reynolds Cruiser is a bosses skateboard shoe, disguised as a low key sneaker. This season Emerica is doing it up right with lots of Vegan choices. Both the White and Black are all Canvas upper. The white has a faux suede diamond emblem on the tongue and the rope laces also look suspect but are in fact vegan. the black model is made out of a heavier threaded canvas which makes it a bit more unique. Soles are Vulcanized with a STI Pro 2 insole. These feel really great skating dispute the low profile look. Makes sense why one would call it a sneaker. Disguises and sneaking go hand in hand. One minute you’re all dressed up at a funeral, next your shooting your board over the ramp on which they wheel the corpses into the funeral home.